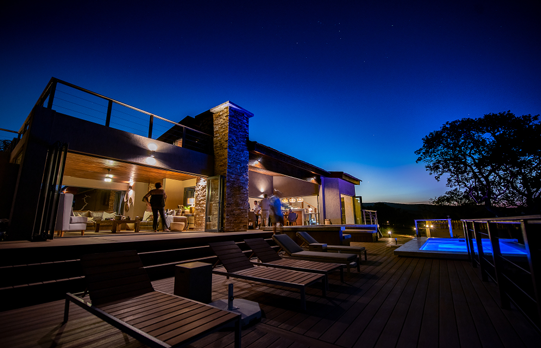 Zimanga Main lodge was recently completed and opened its doors in April 2018. The lodge can sleep up to 12 guests in six separate air-conditioned luxury double suites, with the ability to host single visitors (no additional single supplement cost) in our four stylishly furnished single rooms. The Lodge is situated in close proximity to the Homestead, with breathtaking views over the Mkhombe Valley and nearby Tamboti Overnight hide from the large deck with sun loungers, large shade providing umbrellas and rim-flow swimming pool. Delectable meals are served within the dining area with cosy fireplace, and the open deck offers another dining alternative for those who prefer to dine outside under the stars. A large circular open-air boma provides the ideal spot to enjoy a nightcap whilst sharing the day’s stories around a small bushveld fire. In between vehicle based safaris or hide sessions one can explore the lovely lodge gardens which host a magnificent variety of indigenous plant and bird species, enjoy a book from our well-stocked sponsored library, relax in the swimming pool or sun loungers with one’s favourite drink, or laze around in your room to conserve energy for the next adrenaline filled activity. A floating staircase in the lodge leads up to yet another deck, built on the lodge roof and offering spectacular views over the peaceful valley in front of the lodge and Lebombo mountain range in the background. An increasingly popular inter-activity pastime is photography discussions/workshops in the well-equipped boardroom, complete with wireless HD projector, drop-down screen and custom built boardroom tables doubling as a museum exhibit, proudly displaying a fascinating collection of local geology and artefacts originating from Zimanga and its nearby surrounds within recessed glass displays built into the tables. The entrance lobby of the lodge is graced by some of the most brilliant images taken to date on Zimanga, and kindly provided by some of the world’s best photographers, guests, guides and friends, and is a feast to behold every time one heads out or returns from activities. The lodge offers not only larger rooms than the Homestead, but privacy, luxury and practicality was also key in the design and layout, making one’s room the perfect getaway retreat to unwind and relax during the stay. Although the lodge is fenced for safety, the possibility exists that wild animals can gain access to the lodge grounds hence it always pays to be vigilant when walking between rooms. A network of cobblestone pathways and bollard lighting links the separate rooms within the lodge grounds. Main Lodge also hosts a curio shop which proudly supports our local artisans with several of their wares on display, plus additional mementoes to take home for yourself, friends or family. All rooms have separate desks to set up laptops for image editing, with ample space and a variety of electricity couplings to make sure equipment remains fully charged. Please note that the voltage in SA is 220v, so please do not use chargers with a different specified voltage. 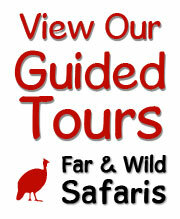 Free Wi-Fi is available all around the lodge and access to hides is determined based on the duration of the stay.